Lonnie Riddle was born January 6, 1912 in Joshua, Texas where he grew up and graduated from Joshua High School in 1929. He joined the U.S. Navy on December 2, 1931 and served as such until 1937. From March 1940 until September 1945, Brother Riddle worked in Air Service Command for U.S. War Department. It was in that capacity that he first came to Waco to assist in opening the Waco Army Air Field(later renamed the James Connally Air Force Base) on March 1, 1942. The Studer Brothers hired him to work in the jewelry shop downtown from 1944 to 1955 and then he opened his own Riddle Jewelers located in the Beverly Hills Shopping Center from 1955 until it closed in 1961 when he was hired by Sears. 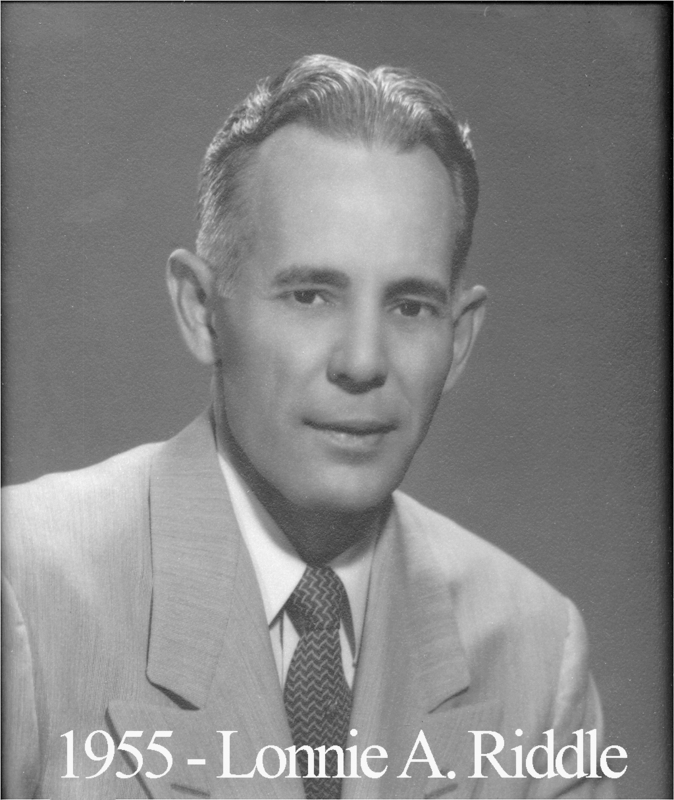 On June 24, 1967, Brother Riddle was elected to follow the legendary William Quebe as secretary of Waco Masonic Lodge. Riddle had already been handling the newsletter duties for the lodge since July of 1954. He remained secretary of our lodge until 1985. Brother Riddle was the Venerable Master of the Waco Scottish Rite Lodge of Perfection in 1971, Grand Junior Deacon of the Grand Lodge of Texas in 1971, and District Deputy Grand Master of District 61B in 1972. He was conferred KCCH on October 30, 1971 and made Regional Chairman for Region #1 of the Masonic Home and School’s Development Program from 1974 to 1976. Lonnie edited the Waco Scottish Rite Valley’s bulletin from 1973-1983. He also earned a lifetime esoteric certificate in 1974.